The night before the White River 50 Miler, I fidgeted in my room at Crystal, wondering why I was there. I’d not trained for the 9000+ feet of ascent, let alone the distance. Work and other part of everyday life had impeded my grand plans to train. Those three repeats up and down Mount Si? Nope. Those trips up to the pass to get in some long work? Nope. Those back-to-back twenties? Nope. 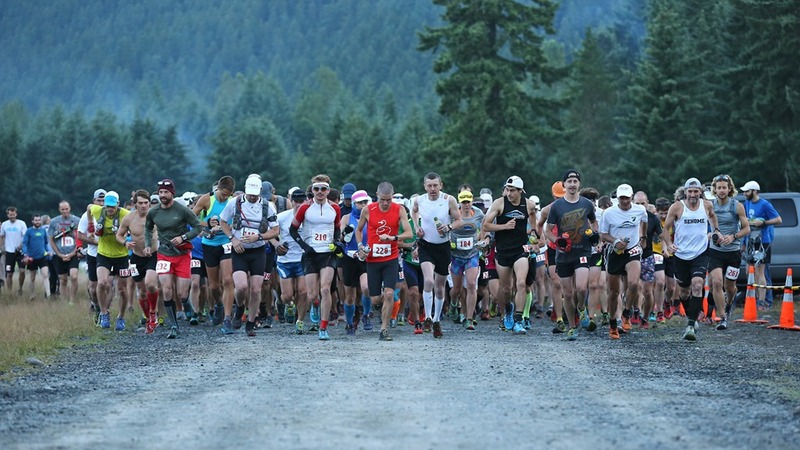 My first DNF (did not finish) in seventy marathons and ultras was a real possibility – and part of me was afraid of that. Kris, my wife encouraged me to try it. “You should go do this – what do you have to lose?” she said. This was her polite way of saying “Can you please stop moping, just go out and do this thing?”. The more I thought about it, the more I saw her point. Also, it had been too late to cancel my room at the Alpine Inn – meaning I would have been out about $100 in addition to the race fees. At the start the next day, I hung out with two ESR friends Justin Carpenito and Bob Wismer at the start. An injury had dashed Bob’s wife Amy’s plans to join us, so she was providing logistic and moral support. Amy reminded me that I needed to represent those of us entering a new age group this year. Now there was some more motivation not to drop out. As we started shortly after six AM, I was thinking that I really had no idea what I was in for. The first several miles were pretty mellow. I was so focused on moving that I ran past the first aid station at Camp Sheppard without stopping. It was a really good thing I was carrying two bottles and lots of fuel, because the big climb started within a mile. The steep switchbacks spread the field out quickly. By now, I’d fallen back from my friends and was soon running solo in the woods. By the time I reached the Ranger Creek aid station, I really wasn’t sure there were 38 more miles in my legs. Doubt lurked in my head. At Ranger Creek, I topped off my bottle, ate a bit, and then set out for the last part of the climb before we’d drop towards Corral Pass. 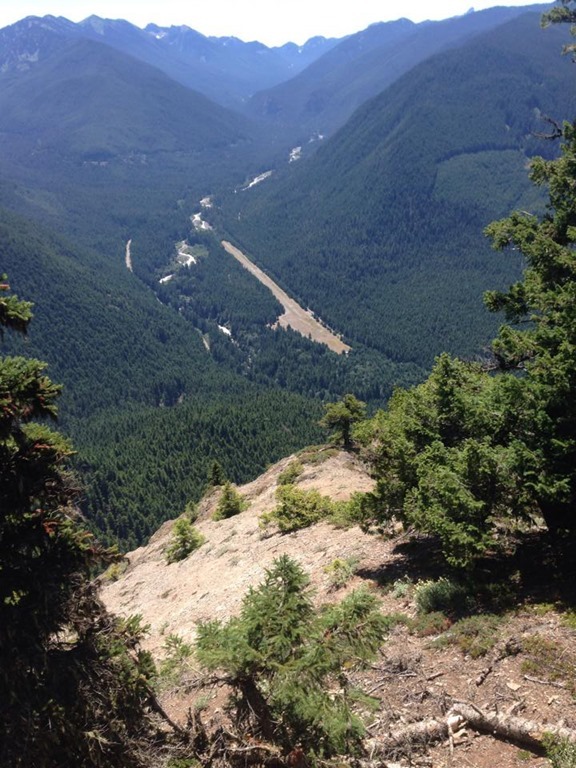 This was really nice – we’d run along cliff’s edge with amazing views down to the start, and out to mighty Rainier. Falling in with Bob and Justin around then was a good boost for me. I confessed that I wasn’t feeling good about my training, or my mindset. Bob turned and looked at me, then pointed out to the amazing panorama of Rainer off to our left, saying “Where else would you rather be than here?”. 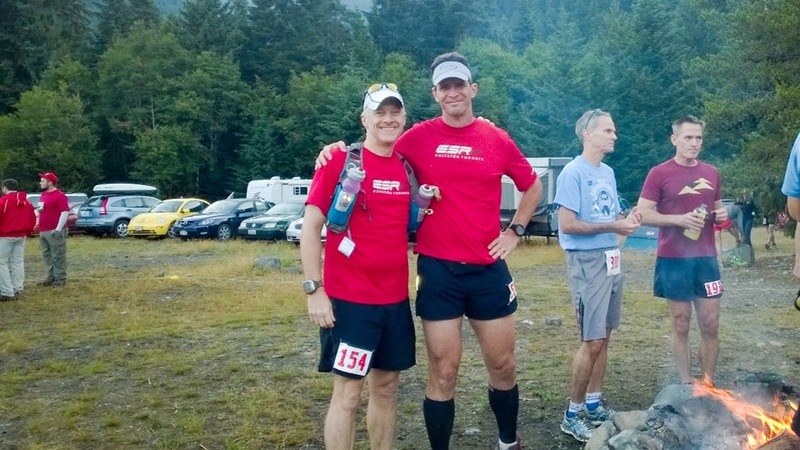 Bob and I first met about ten years ago while doing the Nookachamps Half in Mount Vernon. Since then, we’ve logged miles during a number of marathons and ultras together. I’ve long admired the way he and his wife Amy pursue things like this as a team. Even when one of them is injured, they’re actively supporting and cheering on the other (like today). And they’ve accomplished some pretty amazing things along the way. Always positive, always thoughtful. I dropped back from the group as we headed back towards Ranger Creek, but I thought lots about Bob’s words. 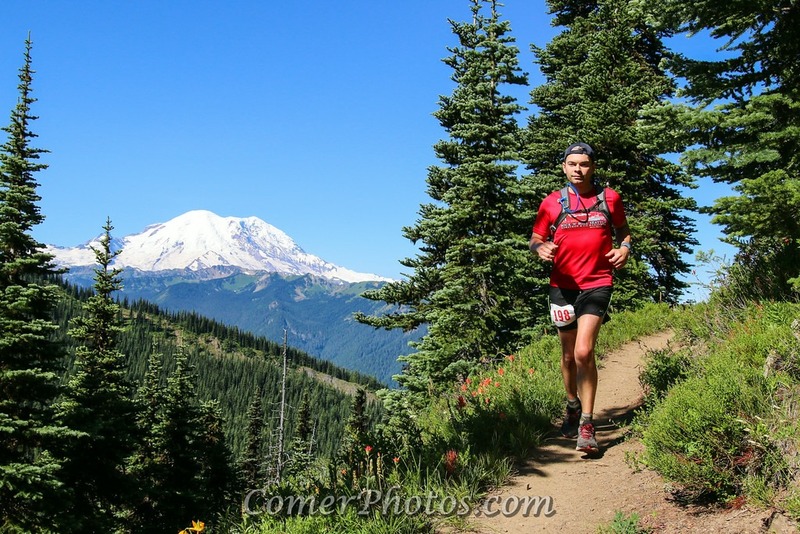 I never thought I’d be running the Cascades as I approached age 50. 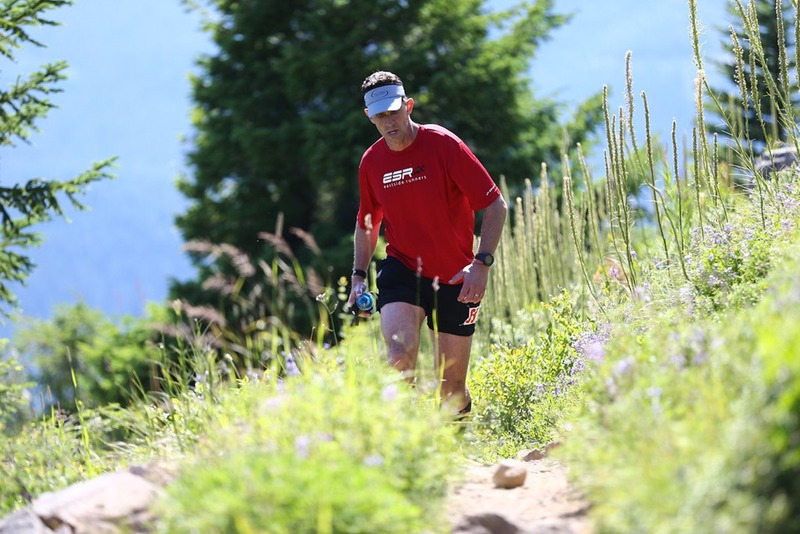 When reflecting on what brought him to the starting line of his record-setting 24 hour run in Brive-la-Guillard France, Scott Jurek talks about how when his discomfort and fatigue become unbearable “I will run because I can”. He tells us that when he struggles to hold a pose, his yoga instructor reminds him that “this is what you came for”. Today I had the opportunity to go farther than I had before. I’d been consumed by all of the things I’d not done to prepare, almost planning excuses to fail. The thing to do was to lean into this difficult pose, and just run – “because I can”. The trip down from Ranger Creek was pretty smooth. I tried to take the downhill from Ranger Creek back to Buck Creek easy, saving my quads for later. 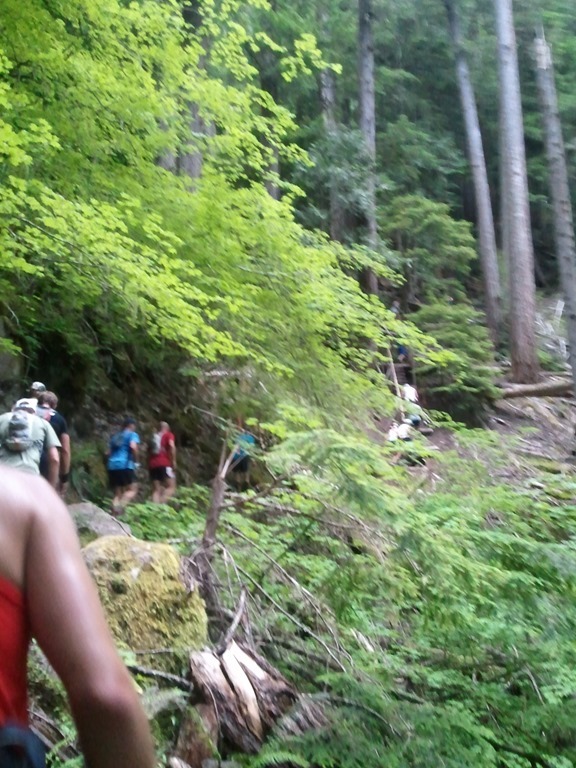 I ran mostly solo, taking care not to turn an ankle on the roots and rocks arrayed on the trail. I rolled back into Buck Creek, just past mile 27 at about 6:19. Bob had come in a bit ahead and Amy was making sure he had everything he needed. I took my fuel out of my drop bag, ate some PBJ, and downed a bunch of liquid along with some electrolyte tabs. We were in for a tough climb, so it was time to fuel up. Amy came over and gave me some sunscreen, and dumped water on my visor – it was getting warm, and this got me into the habit of stopping to drench my head and neck at each opportunity. Then it was time to go, before I had too much time to think about it. We had 23 miles ahead of us. The four and a half miles to Fawn Ridge started out easy, but quickly got steep and tough. Some negative mind-fog had rolled in again, and thought to myself “just keep moving”. 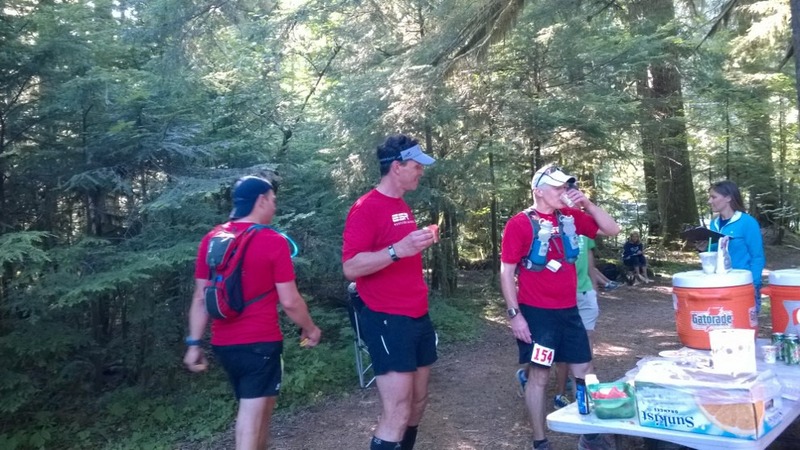 When I saw the aid station up ahead at mile 31.7, I’d already been on the course for over seven hours. There I quaffed down more fluids and fuel, and then set out again. The trip from Fawn Ridge to Sun Top was the hardest part of the day for me. The climbing was relentless. We hit a false summit around mile 34 or 35. Then just after coasting downhill a bit, we had to slog up to Sun Top on trail that was both steep and exposed. Just keep moving, I told myself, even as my confidence waned more. As I climbed that last half mile in the sun, my steps got small, but my feet didn’t stop. At Sun Top, I met Bob and Justin again. We sucked down lots of fluid and fuel. I gingerly lowered myself into a chair, wanting to rest my legs a little. Knowing what the problems gravity presents after 37 miles and nearly 9000 feet of climbing my friends warned me to “beware the chair”. I lingered a bit longer there, catching up with them just down the road. 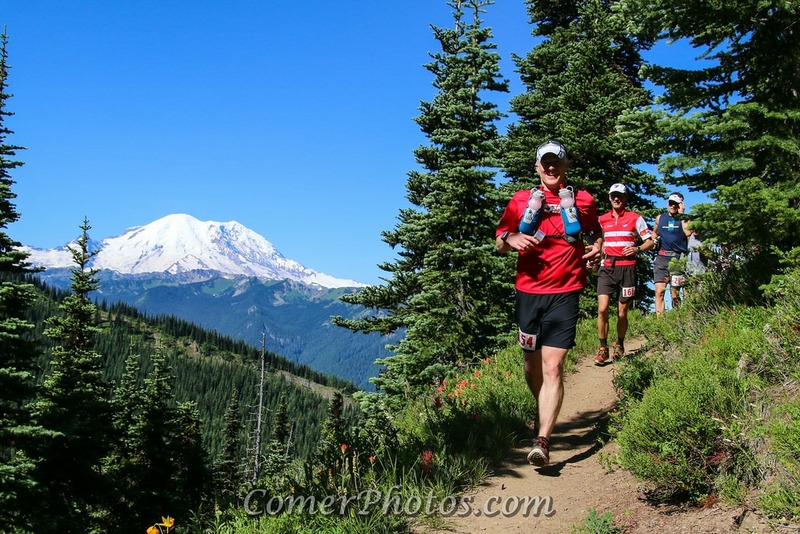 That first turn on Sun Top gives possibly the nicest view of Rainier on the course – a great way to start down the hill. This is where things turned around for me in a big way. We were all tired, our bodies hurting as we ambled down the road. There’s something about running as a team that shifted our focus away from those inner voices telling us negative stuff. It’s hard to describe how that emotional veil lifted as we swapped stories about life. And we kept moving. One of us would set a new pace, and the other two would follow. Now we knew we’d finish this thing. “Start together, finish together” became the motto. We were a team, pulling each other along. Justin and I celebrated milestones marking new longest runs, and Justin got us to celebrate by running into the Skookum Flats aid station. When we were recharging, Amy complemented our ability to speak in complete sentences that mostly made sense. I caught up with my friend Wendy, who was working the aid station – she’d been there when I’d completed my first marathon in Anchorage, sixteen years ago. Back then, I never would have imagined I’d do something like this. But here we were. 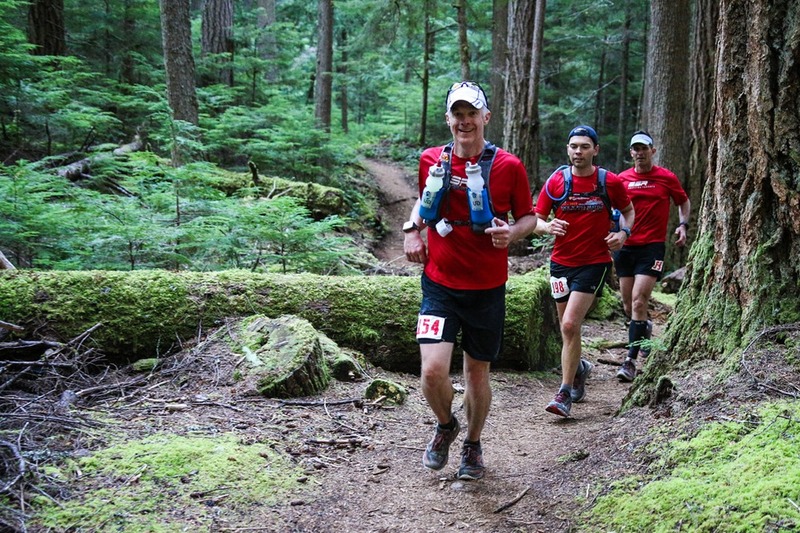 Team “Red Shirt” set out on the Skookum Flats trail with 6.6 miles to go. Quick math told us that getting in between 12 ½ and 13 hours was within reach. The problem was that the “Flats” really wasn’t so flat, and there were roots and rocks to contend with. We’d run a bit, then would walk a while. Eventually the trail narrowed and climbed until we were a couple of hundred feet above. Good thing most of my blood was flowing to my legs, otherwise I might have been more conscious of the steep drop-off on my left – not much to grab onto on the way down. With a bit under a mile to go, Bob started to run. No one said much, we just kept moving. As we got close to the finish, things leveled out and it got a bit easier. Winding out that last little section as we entered the airport, we could see the turn to the finish up ahead. We turned it up a notch as we got closer. We crossed the finish together in 12:59:28. “Start together, finish together” had worked. Amazing feeling. 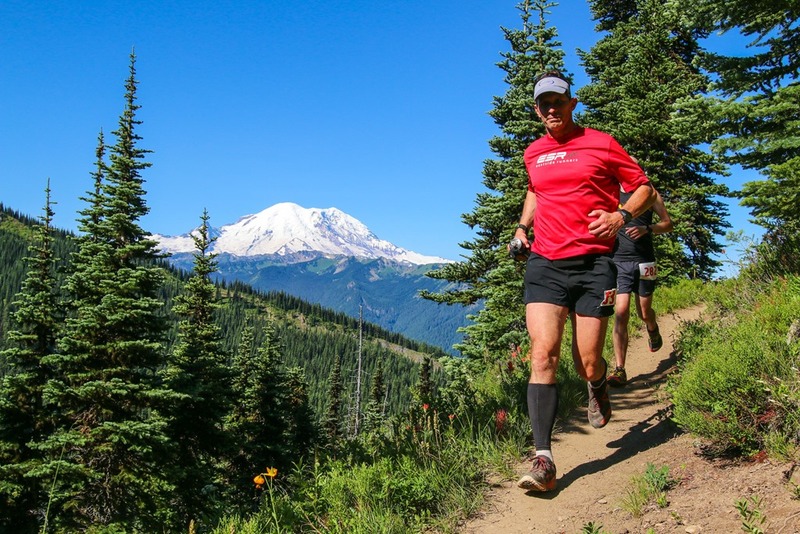 I’ve completed 70 marathons and ultras in my life – roads, trails, flat, and not. Some were harder than others, but I’d never experienced anything quite like this. Next time around, I’ll prepare – more hill training, and more quality miles – build my spirit and body up a bit more. But two weeks later, I’m still taking in the experience. It was a great reminder to trust ourselves to dig deep when we need to. To just keep moving, and focus forward. 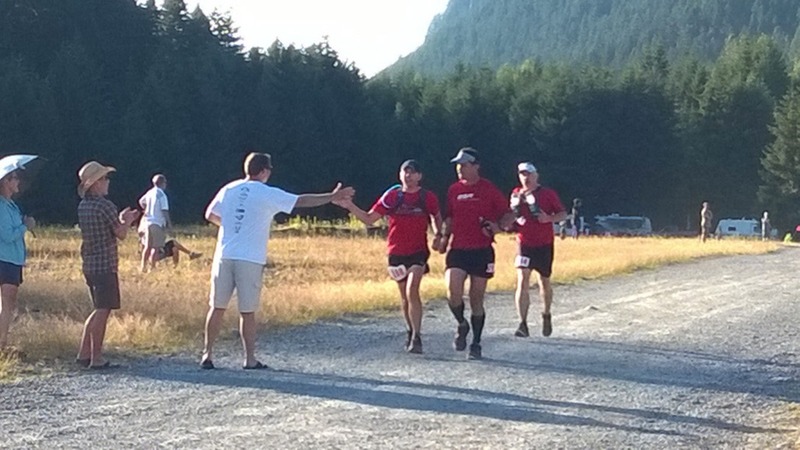 And the team feeling to finishing with Justin and Bob was amazing. Working together kept things positive, and brought us in smiling. Start together, finish together – it works. Believing Kris when she said “You should do this, what do you have to lose?”. Conversation with Tom the night before at the Alpine Inn about races old (fast ones for him) and new. Tom also finished his first 50 miler the next day. That moment just after starting that it really sunk in that I had no idea what I was in for, or what it would be like. Bob’s pep talk as we headed back to Ranger Creek. Amy’s smile and her help getting me focus forward for the second half. Digging deeper on that last half mile up Sun Top. Wouldn’t have believed I’d be able to do it. 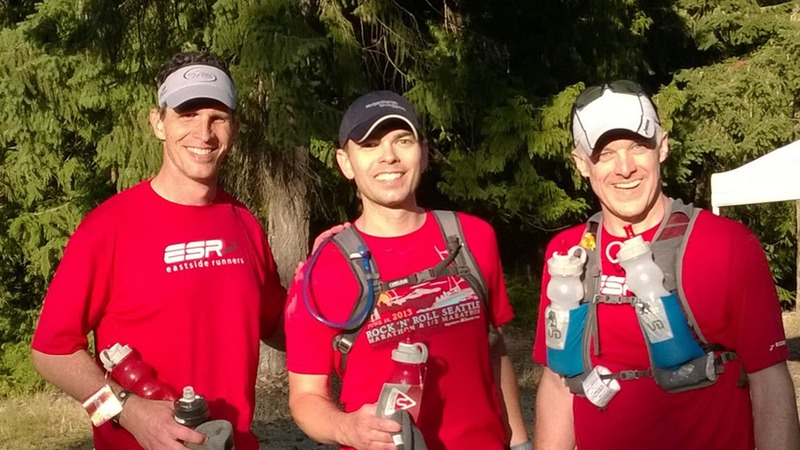 Falling in with the “Red Shirt Team” after Sun Top. Learning that it’s easier to run level than downhill after 37 miles. Bob running into someone he’d met at the Kettle Moraine 100 in Wisconsin several years back – mile 40 was best small world story of the day. 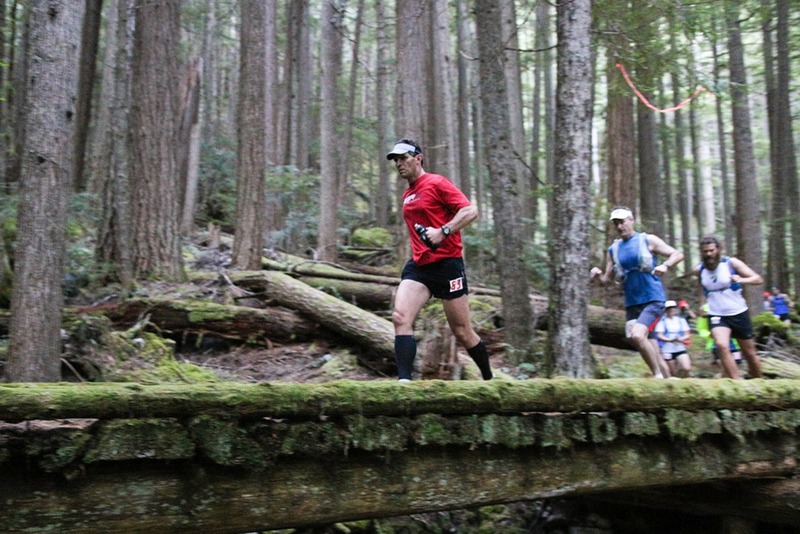 Getting passed by Jess on the Skookum Flats Trail – she was running the course for the second time. Internalizing Scott Jurek’s message that “this is what we came for”.